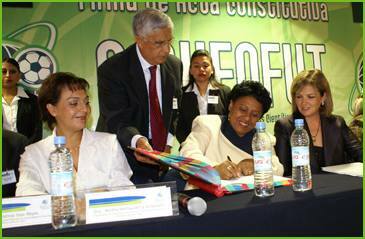 The formal signature of the incorporation papers for AMUECFUT was carried out in Tuzoforum Convention Center in Pachuca, Hidalgo, Mexico. This event was presided by Gabriela Murguía Cánovas, PhD. ; President of AMUECFUT and Chairman of the Board of Directors of the Football and Sports Sciences University; Beatriz Sánchez Cordoba , Director of the Manuel Fajardo Superior Physical Culture Institute of Cuba. The event was officiated by Notary Public Rafael Arriaga Paz and the documents were signed to validate the creation of this scientific association. During the event, Gabriela Murguía, PhD, gave a speech in which she emphasized her interest in working with colleagues doing similar work "”We have concluded the first phase of a research project on performance of high performance athletes and we plan to expand to other countries such as Spain, England, and Germany". Among those present were the Vice-president of the Association, Mirtha Hechavarría Urdaneta, PhD; Antonio Peralta Flores PhD. ; MBA Cristina Islas Reyes, Secretary of AMUECFUT; Professor Andres Fassi Jurgens, Sports Director of Pachuca Football Club and Mr. Juan Manuel Samperio Director of Professions at SEP (Secretaría de Educacion Publica , the maximum Education authority in Mexico). This worldwide association integrates a number of university based researchers who have developed or participated in research projects related to one of the most popular sports in the world: football.